Dr. Jon Tinkle is a chiropractor serving the Richmond Indiana and surrounding area, specializing in providing natural relief for neck pain, low back pain, disc injury, sports injuries, headaches, and much more. The staff at Tinkle Chiropractic are dedicated to finding the exact cause of your pain and eliminating it through safe and effec tive healthcare. Our mission is to go above and beyond the expectations of our patients in achieving better health, naturally. Everything our office offers is focused on getting you back to enjoying life, pain-free, and on your terms. Dr. Tinkle welcomes you to stop treating the symptoms and start treating the cause of those symptoms. He and his staff have a genuine concern for your well-being, and will take the time to explain to you what is causing the pain or dysfunction in your body, and develop a specific treatment plan to correct it. Patients seeking treatment at Tinkle Chiropractic with Dr. Jon Tinkle are a ssured of receiving only the finest quality care through the use of modern chiropractic equipment and technology. We have state of the art Digital X-ray and Infrared Digital Thermography equipment to assist us in finding the exact cause of your problem. In addition, we have private rooms and personalized care for each individual patient. "I've never met a chiropractor who is more focused on explaining your problem to you, or more genuinely concerned about your well-being than Dr. Tinkle. Aside from being an excellent chiropractor, Jon has a great "bedside" manner and will actually take the time to speak with you about your ailments. 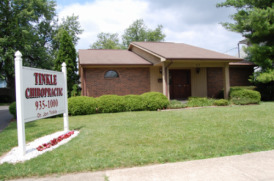 The bottom line: Dr. Tinkle is the best chiropractor in Central Indiana / Ohio! At Tinkle Chiropractic your treatment will be specific to your ailment, and every patient is treated differently depending on their problem. We not only focus on back pain, neck pain, headaches, scoliosis, fibromyalgia and other common concerns, but are also experts on exercise, wellness and nutrition. Spinal Decompression, a leading edge non-surgical and non-invasive technology, is available for our patients who suffer from disc injuries, sciatica and other nerve compressing conditions of the spine. "The purpose of our practice is to help our patients to live a healthier and more energized life by removing the cause of their pain and suffering, and then taking steps to prevent that cause from returning and optimizing their overall health. We realize each individual is unique, and each will be treated this way in order to maximize the benefits of the treatment they receive at our clinic." -Dr Tinkle. "I've never met a chiropractor who is more focused on explaining your problem to you, or more genuinely concerned about your well-being than Dr. Tinkle. Aside from being an excellent chiropractor, Jon has a great "bedside" manner and will actually take the time to speak with you about your ailments. 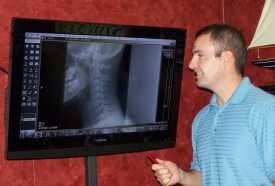 The bottom line: Dr. Tinkle is the best chiropractor in Central Indiana / Ohio!"